These survey results are based on responses from CAD users, Designers, Engineers, Professionals including managers and senior executives. Almost half of those surveyed had upgraded (34%), changed their primary CAD Software (6%) or added an application to their CAD software (9%) in the last 12 months. 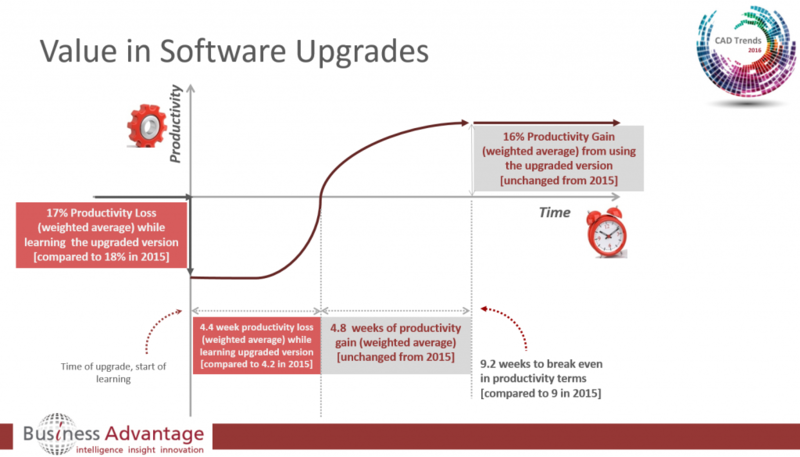 To determine the business value of software upgrades we asked those who had made these changes a series of questions around productivity during their transitions – the CAD productivity changes are the individual users’ own assessments as percentage increases or decreases in their productivity. Was there a temporary loss of productivity soon after implementing or upgrading your CAD software? What was the loss of productivity soon after implementing or upgrading your CAD software? For how long did the loss of productivity last? Once your company learned the new software what productivity increase have you achieved over the previous way you worked? The results show that on average CAD users’ productivity breaks even in just over 2 months (an improvement since 2014, stable since 2015) after a CAD software upgrade and thereafter continues to produce productivity gains. 57% reported no loss of productivity during the upgrade process and 30% acknowledged a temporary loss in productivity (the other 13% didn’t know or couldn’t say). The average loss while learning the upgraded version was 17% and this lasted an average of 4.4 weeks (for comparison, in 2015, the average loss was 18% and it lasted for 4.2 weeks). Based on the survey findings, we can therefore conclude that CAD software upgrades are delivering a net productivity gain and hence real business value to CAD users. Watch this blog series for regular updates with more detail on other CAD trends from the 2016 Worldwide CAD Trends Survey. Naturally the report is a high level summary of insights gained from the data gathered and this series of blog posts enables us to add further detail but if you are interested in still more detail, such as information on CAD Upgrades by Vendor, by region or industry, give us a call to chat with a research executive about your needs.